What will be written here will not be read again, corrected or revised. It is after all the truth, and the truth always hurts. She recalls the first time. He stands in the waiting room. He stares at her in utter amazement. Later he tells her of the time he first set his eyes on her and how love walked in right then. He says that it is love at first sight. She believes him until today. Nothing matters but the two of them. It's the two of them against the world. Their sole purpose...love. With every look, the need to connect intensifies. Then one day, he breaks the news. He has to go. He doesn't want to leave but the choice isn't his to make. The tears flow freely at the thought of being apart. They cling to each other and to their dreams until the very last moment. And then, the good-byes arrive. Her mind wanders off to the incident last night. Joy overcomes her as she longingly waits to be in his arms again. And then, he spoke. His love is no longer strong. He wants out for he needs to share his love with another. She remembers the words, the pain and disappointment, but always, she'll remember the look in his eyes. The beautiful brown eyes she adores no longer look at her in pride. Replaced with helplessness, she holds on to that memory for it'll be the last time she'll get to look into them. She's willing to remain by the sidelines and wait until his love is solely hers. She cries. She pleads. She hopes. But never will she accept his decision. Her expressionless face is smudged with unwashed tears and pain. Without destination, without hope, she automatically walks and finds her way home. In the comforts of her room, she undresses. Half walking, half crawling with eyes shut, she finds the soft, lumpy mattress of her unmade bed. She curls up into a tiny ball, allowing sleep to overcome her. Fatigue does not permit the tiniest of dreams to enter and she is lost...willingly. His name will remain with her always. His face, his voice, his scent and oh the touch will not be forgotten. Each turn she makes, her mind wanders back to what was once. Reality sneaks in after a while. Nonetheless, the comforting past drags her back repeatedly. For she still refuses to accept reality. It has come to a point where nothing else matters. The emptiness he left behind has led her to be this way; unfeeling, painless, fearless, almost untouchable. And she remains this way for the longest time. His name forms softly on her lips. It comforts her to know that she still recalls his name. Numerous tries did not allow her to forget his name, not even for a moment. She misses him terribly, each night praying for one last look, one last glance and one final touch. Her wish remains unheard, until today. Walking along by herself in the art gallery, she pauses to stare at a piece. Magnificently captured, the overwhelming colours cry out for attention, touching her to the very soul. Overcome with unexplained emotions, she swiftly turns around for she feels an unmistakable presence. She stares in disbelief for he is standing behind her. And standing tall he was with only a slight tinge of meekness. Still as beautiful as ever, he was a work of perfection. She cannot forgive herself for having such kind thoughts, even after all this time. Slowly, cautiously he forms an uninvited smile. Without understanding, she mirrors his smile with one of her own. It's always exciting when something happens for the first time. Her first smile in two years feels equally so. Warm and cozy inside, she allows her smile to go a little bit broader. Torn between two emotions, she ponders for a while. She succumbs to the fear of being alone and helpless again. She continues to stare once again into those wonderful brown eyes, and then she pauses. Clearly shown in those treasure called eyes, she sees her pain and anguish, and almost immediately, everything tumbles back into place. She shuts her eyes, simultaneously trying to shut out the memories of what it's like to be lost and in solitude. The pain overcomes her, forcing her back to reality. Smile still intact, she faces him and sees him take a step closer. His sudden alteration in position frightens her and she takes a step back. For the first time in two years, he sees her pain, her need and her desire. Slowly her fears turn into tears. His smile dissolves into emptiness and he makes a move as if to walk away. She holds her stand contemplating on her next step. Realizing that two years will turn into three, she decides almost instantly. She pushes all other thoughts away and strides forward. Never did he imagine she would dare be this close. She walks on, stops right in front of him, halting his smile. He looks helpless and sorry. At any point in the last two years, she would have relented and forgiven him. She wasn't given a chance then, but the chance awaits her now. Her smile widens itself as she inches upon him; understanding what needs to be done. Slowly and with utter grace she gives him one final glance and walks away. He looks at her form slowly disappearing from sight, knowing now that walking away from her two years ago was a mistake. He longs to explain and seek permission for a second prospect. But gradually the realization dawns upon him. He now knows that she gave him that chance for two long years and he never took it. hi marzie, this is so sad. but the lady hv made a good decision at the end. Even tho' its only after 2 yrs but sometimes we just need time to digest the reality. But in reality would the woman who had waited so longingly for two years just let her heart make the decision to leave the soul she longed for in the blink of an eye? Hard to say but I think not...afterall she is still living an empty life without him. So why now when the opportunity presents it self does she want to assert her feelings towards the guy. She had two years too to let him go! Yet she clung on...and now when the chance presents itself she throws it away...for what? Pride? Yes maybe he did hurt her terribly and this is her revenge but isn't there some forgiveness and compassion that must be expressed for life to go on...it really doesn't need to be done sometimes! Oh such a beautiful story GP.. but like Jean said.. the lady made the right choice.. coz if he's done it once before, he could do it again. Sometimes in life, you have to do what you don't like.. sometimes in life, you can't follow your heart..
Wow Marzie! Beautifully written, I almost cry! Well, I lied, you know I'm a cry baby! Truly very beautiful! Hi GK, it's so nice to see how my tale can stir up such strong emotions within. Thanks so much for your valuable insight! Marzie, quite an interesting story. I'd have to agree in a small way with GK about waiting for a whole 2 years. But then everyone is a little different when it comes to matters of the heart. What might take someone a day, maybe a week or even a month to recover might just take someone else an eternity! People don't think straight when it comes to love GK, so I'm not going to judge that girl. She's the only one who truly knows the reasons why she did what she did! well..I cannot cry since I am reading this in the office..but the story ..hmm..I am glad tat the lady finally makes her choice..a good choice indeed..
"The first time may not be perfect but it cud be the one & only chance". Oh Marzie this story is so very moving. I truly don't know how to react to it accept to say that it is beautifully written. I love all of your writings and your entire blog. So please I have a little something for you. It's ok Marzie. A gud cry is just wat I needed rite now. It's true wat u said, "The eyes are blind. 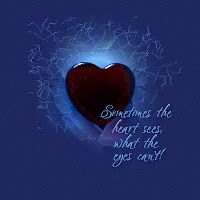 One must look with the heart". Thanks 4 sharing the beautiful story.Take care. Oh dear this one sure brought us to tears. We were so moved by it. Everyone here agrees that the girl did the right thing, and we ditto that. It is fine to follow your heart, but doing it too excessively can bring u nowhere. U also need the mind to work with u. Doesn't matter how long she took. Eventually, she learnt to move on. And when she did that, it showed that she loved herself. How can u forget to love yourself just because u love someone who had broken your heart before and can break your heart again? It's a sheer waste of time! LOL! You really have talent for writing. This is a sad tale. I hate it when people do not "live happily ever after". But then, I think the girl did make the right choice. Blessings. Thanks for the beautiful story. Moreover what was that old saying...If you love someone, set them free. If they come back they're yours; if they don't they never were. Marzie, you are a great writer! This story is well said and so beautiful! Do write this kind of post again... love it! Oh I forgot to tell you that the black heart picture is perfectly described the post! Awwww.. that was beatiful. I was totally captivated by your story. I kinda agree with what GK hasta say, but as a girl, I do understand why she walked away. She's been longing for him for 2 whole years but it was more like 2 whole years of pain. So to think that he could just pick off where he left is sooooo unacceptable (for me!).. Hehe..
Amazingly well put into words Marzie!! Guys can get the same too, the hurt, the pain, the betrayal, and at times the heart cannot be followed to take another blow which would be even more devastating. The 'lady' made a wise decision as far as I'm concerned. Hi Marzie! I am so sorry I have taken so long to comment on this post. I actually read it the day you published it but I haven't been able to as I've been unwell as you know. This is a beautifully written piece and it is my favourite of anything I have read from you. I understand how you feel and I am so happy that you have come through it and now have love. When I saw my ex recently, it literally ripped me apart. Crying for days and having thoughts of what could have been running through your head every second is something you have apparently been through. I feel like I know you better after reading this. It's really wonderful to be able to express things that are not happy. I am touched by your honest perspective and the eloquence of your prose. You are a truly gifted writer and I for one am very pleased and honoured to read this. Again, I am sorry for being away and being so negative. I will remember what you wrote because I think there is a powerful lesson within. Hi Bobby! It's so nice to get a comment from u here, esp since I know ur still down in the dumps, are thing looking up for you yet? Thanks for reading this post, I know it's rather long compared to my usual ones. This isn't abt me per se, but it does portray my feelings on how I see the situation. I'm so glad u liked it. Once in a while, it's good to write about something sad, that's how I see it anyway! i cried la reading this! Yes very the sad GP.. really touched my heart lahh.. it's time to move on for everyone!! marzie, keep all your poems safely. you might want to publish your poem book one day and when you do that, do let me know. I would love to design your poem book! Wah GP coming up with a book ke.. nak beli! !